Just noticed that the AC is not playing, just ambient temp air out of the vents, regardless of what temp is dialled into the climate control system. I’ve seen a fair few threads on forums that the condenser is the usual suspect, however still in shock at a price of £750 (incl regassing) from the Inverness Honda dealer. 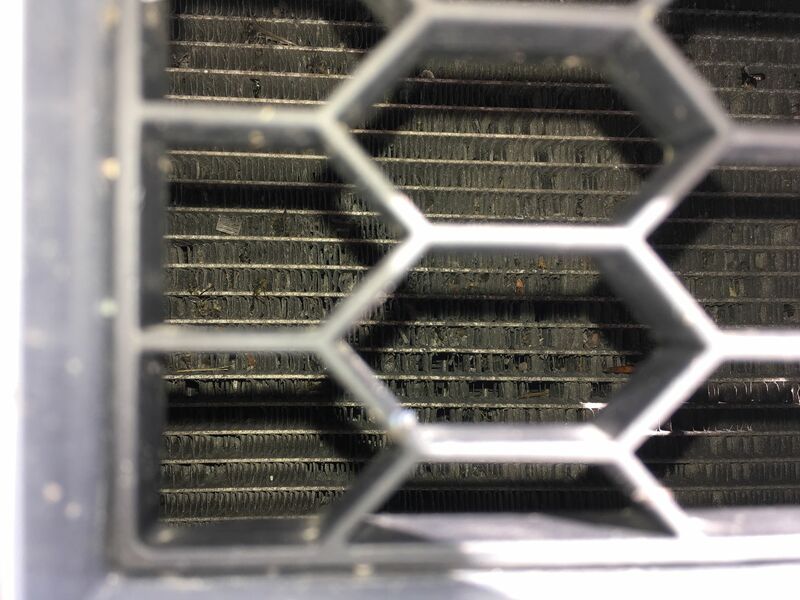 The condenser is certainly in a really, really rough way, and the pics below don’t really do its roughness justice. The lower section is jammed solid with muck, seeds, bugs, etc, etc., and whole sections of the fins missing. 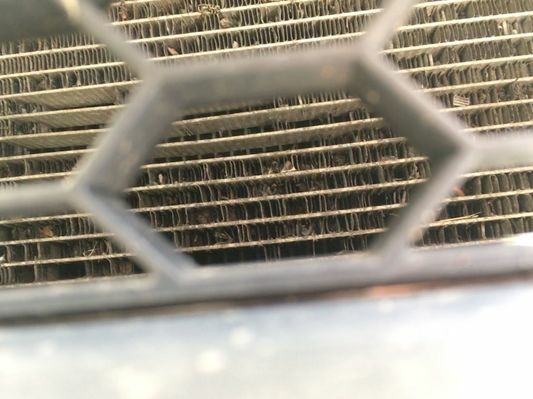 Also a new symptom, or we just haven’t noticed it, is that the “fan” not powering up after starting or when driving around, something that had always happened since the car was new. I’m wondering if that fan is part of the AC system, not the engine cooling system as I’d just assumed. Car is an 11 plate Jazz GE. Any thoughts out there before I just have it regassed and hope that if it is just a slow leak then it will last the summer? Is the A/C clutch pulling in ? you will hear a clunk and maybe a change in engine note. The system has a pressure switch and if gas pressure is low the clutch will not pull in, not sure if fans still run ( the engine and A/C both run together when aircon selected, maybe to make sure hot air from aircon rad does not get blown through engine cooling radiator). There have been horror pictures of heat exchangers posted on here and consensus seems to be don't use high pressure water jets on the radiators. It does not help that Honda does not think it necessary to fit mesh in the cooling gaps in bumper, which lets stones and other crap through. Only time the car gets washed is it’s annual service, wouldn’t be surprised if they did use a power washer on the front. I’ve just been out fiddling with the car, doing the obvious and checked the AC clutch and condenser fuse, both OK. I then started get up and the AC clutch kicked in briefly, freezing air from the vent with my hand in front of it but then the temp rose up to ambient (10c at the mo). Going to get it refilled and see if that works. If it lasts the summer then that’s good enough for me. I think Kwik Fit used to to a 'no regrets' refill. As in, if they refilled your A/C and it did not cure your problem, there was no charge. Up in this part of the world Monday was the first day when it was warm enough to tell something was amiss. AC might have not been working since this time last year!! I’ve got a load of tyre swaps to do at our local ATS so will get them to try refilling it. ISTR they do a pressure test so if there is a leak then I can go off and get that fixed first. My condensor looks pretty rough too, but the aircon still functions pretty well. It's only the cooling fins that are disappearing, the actual pipes that carry the gas look reasonably okay. As culzean says, don't go anywhere near is with a pressure washer, or you will lose some more of it. I then started get up and the AC clutch kicked in briefly, freezing air from the vent with my hand in front of it but then the temp rose up to ambient (10c at the mo). Sounds like it 's holding some gas, which is good news. As soon as the compressor starts, it's dropping the low side below the minimum pressure switch threshold. Probably not a leak, you get natural leakage of the gas past the seals in the pipework, particularly if the aircon is not used for a period, allowing the seals to dry out. For that reason, it's a good idea to run the aircon at least once a week, even in the winter, just to redistribute the oil throughout the system - this helps prevent leakage of the refrigerant. Eventually, however, all systems need regassing. If you take it for a re-gas, they will do a vacuum test before refilling. It's not infallible, but it should find any significant leaks. Any of the more difficult slow leaks can usually be found after regassing, either with a sniffer tool or by putting a UV dye in the gas. I had 9 years without regassing (no idea how many years it had gone before I got it) but I used my AC constantly, summer and winter. Among other things, it keeps the car dry inside. Stops that damp smell when you trail snow in on your feet! I leave mine on summer and winter too. Can't say use ours as much as others...that what windows are for! But, on serious note, does it not advise somewhere that we should 'use'/turn on air con for at least 10 mins, once a month, to keep things running! Will switch AC off tomorrow and leave it off until it gets regassed, probably next week sometime. My Volvo, the AC came on automatically if you switched the fan on while the control was set for Demist. The only way you could stop it was by selecting Recirc. Honda always gives you the worst situation. Get a Aircon specialist and get 2nd opinion. Are you sure the gas is not leaking? My garage put a dye for me many years ago on a Civic after regas to check where the leak was. Right, confession time. Went to switch off the AC this morning, reached for the on/off button and SWMBO chirps out “it’s already off!”. Hmmmmm, thinks I, wonder if that was the problem all along. Couldn’t test it this morning as it was +3c setting off to walk the dog, +5c when back home. Waited anxiously until the afternoon walk, temps well up so difference would be easily apparent and sure enough AC = on meant freeeeeeeeeezing cold air. Looks like when MrsDSL was randomly stabbing buttons (as is her way) she managed to switch the AC off. I am deffo blaming her, and needless to say she is definitely blaming me, however it’s her car so that trumps all. Many thanks for all your assistance, I’ve learned lots from the exercise including how to get to the fuses, and my faith in my Jazzes is restored.